Mr. Legend ~ nostalgia tells us the past was always a golden age. 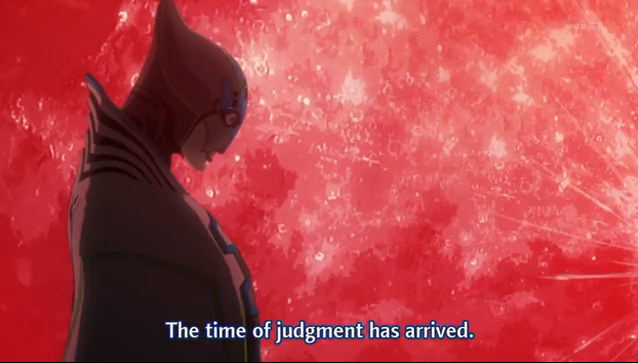 Tiger & Bunny episode 16 was a significant development for the series. It was darker than most episodes have been, not because of more graphic violence, or because it peered into the minds of evil characters, but because it examined human limitations, and human failings. It also very cleverly intertwined at least three stories (all related in some way). It is so significant that I don’t recommend reading this post unless you are caught up with the series. Bunny is celebrated for breaking Mr. Legend's record. I said at least three stories, each of which are related in a sense … to Mr. Legend. The first story is Barnaby Brooks Jr. In this episode he breaks the record for points set by Mr. Legend himself. Barnaby (AKA Bunny) is the rising star. 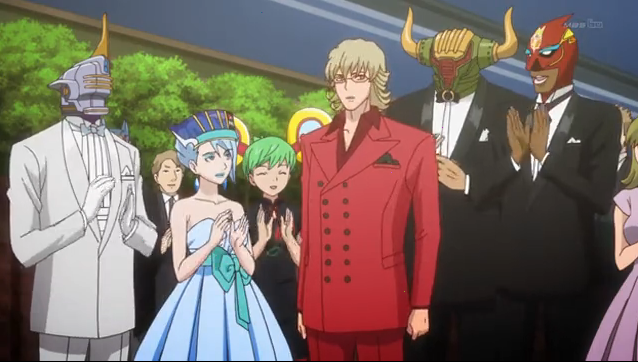 In a conversation with Tiger, Bunny reveals that Mr. Maverick was a friend of his parents, and was with him moment’s before he saw his parents murdered. I have said before that I don’t trust Mr. Maverick. This added bit of information makes me trust him even less. Wild Tiger is losing his chops. Can he go out more gracefully than Mr. Legend? The second story is about Kotetsu (AKA Wild Tiger), who has discovered that he is losing his Next power. His friend Ben comes up with some shocking information: Mr. Legend also started losing his power, so he started drinking, and the other heroes had to cover for him. Not only is Kotetsu’s power critical to his own sense of self-worth, but the man who linked that for him was Mr. Legend. Finding out that the man he idolized was flawed was as much a kick in the nuts as realizing that his own powers are fading. This time his 100-power gives out before he can catch the criminal, a man who murders women for fun. Lunatic's connection to Mr. Legend is the most shocking of all. In what can only be described as a truly unexpected plot development, it turns out that Lunatic killed Mr. Legend, and arguably was justified in doing so. Now my point here isn’t to argue for Lunatic’s idea of justice (that is what the whole Lunatic versus Wild Tiger dynamic is for), but let’s face it: a violent drunk was beating his mom, that violent drunk had sporadic Next powers, sufficient to laugh off young Lunatic’s first attack. Certainly one could argue that a less lethal solution would have been preferable, but clearly the young boy was acting AS A HERO, protecting an innocent from someone who was viciously abusing her. Further, Mr. Legend had a way to prevent his death; he could have stopped beating his wife when his son pleaded with him, but he didn’t choose to do so. The thing that really made this episode great, however, was the way these three threads were woven together, so that the contrast between Barnaby’s rise and growing fame, was contrasted with Kotetsu’s (literal) fall into a trash heap. After Tiger’s noble attempt at heroism failed, Lunatic was free to take care of the problem, burning the “Lady Killer” instead of sending him to prison. A great episode indeed. I also have high hopes for next week’s episode. Now that Kotetsu is broken of spirit, he will finally go to see his family. Whoa amazing episode of T&B this week damn some interesting plot twists around Lunatic’s past life! And his dad Whoa I honestly did not see that coming at all. 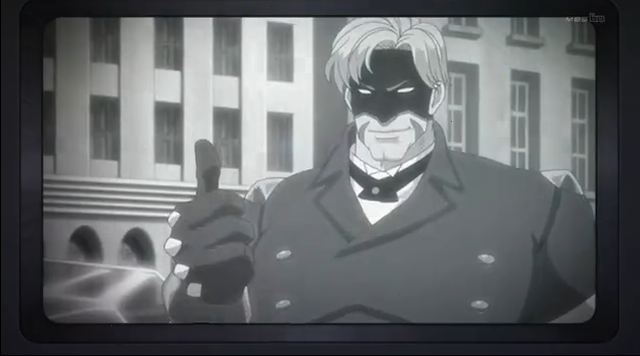 I was thinking the guy that raised Barnaby was evil, because it seems strange when Barnaby was younger, walking into his house to hear gunshots? Seems like there might be something with that. And last poor Kotetsu! The one character we don’t want to see down and depressed. Ah well I can somewhat see the ending in my mind how you don’t need powers to be a hero! Yes cheesy but not bad. Yeah, I really enjoyed it. They did a pretty good job with this series. That twist with Lunatic was quite impressive! Anyway, I feel so sorry for Kotetsu… He was twice saved by Barbaby when he was falling, but this time he really fell and fell into dumpster… I just hope a happy ending awaits in the end!! 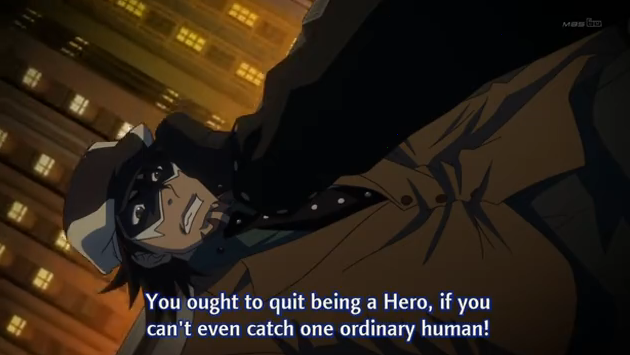 The way that Kotetsu’s fall coincided with Barnaby’s rise really was great. Though I took it more as a sign that Barnaby might not need him anymore, that he would do fine enough without his sidekick. Another thing to tell him that it’s about time he hung up his suit. Other than that for Mr Legend being flawed, let alone Lunatic’s father was a nice twist. It’s great to see that even the ideal hero that Kotetsu looked up to didn’t exist and Lunatic being his son has me hoping he’ll be able to further poke out the holes in his idea of justice when the time comes. Also crossing my fingers for Maaya Sakamoto voicing Kotetsu’s wife in the next episode. I hadn’t heard anything about Maaya. Is that a rumor going around, or just what you hope will happen? (Always a treat to get her involved). Her role from the first drama CD, she isn’t the type of VA who’s hired for minor roles, or at least ones without some extra signifigance to make them semi-important before the end. So it’s a bit of both, it’s a role that would fit but it’s mostly just speculation.